iLife: A Solution to Katyushas? While on Haaretz’s Link English edition website, reading about Olmert’s decision to (finally, to Israelis) authorize the implementation of the IDF’s full-scale ground offensive, I saw this advertisement, placed so very conveniently in the middle of the story. “For thousands of years it has been proven that the Jewish people have the ability to incapacitate and destroy their enemies through increased Torah study and prayer. Sign up now for weekly Torah commentaries. What?? 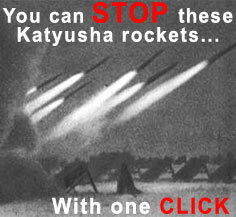 I thought I was being sent to a site where I could buy M-26 rockets and nukes in bulk! Instead I am being told that my clicking on this picture and studying Torah from these people has some supernatural effect on whether or not cities in Northern Israel are bombarded with rocket attacks. The message is clear, I don’t even need to spell it out for you, but I will: ‘For thousands of years’, the Jewish people have been subject to persecution and torment from their enemies, but they were not defeated. How do we know this? The Jewish people, as a nation, still exist today. The Jewish people were able to ‘incapacitate and destroy their enemies’, i.e. win. How did they finagle getting thousands of slaves out of Egypt, one of the most technologically and architecturally advanced societies at that time? Okay, maybe the Egyptians weren’t that good at security. They should take some help from Israel. How did the Jewish people manage to retain their cohesiveness in exile when all evidence pointed to a contrary outcome, one that plagued the Northern tribes after they were defeated and dispersed by the Assyrians in the 8th century BCE, namely assimilation? How did a small but highly organized and motivated Jewish community in pre-Israel Palestine defeat the armies of six nations and declare independence less than a decade after six million were killed in Europe? The solution, according to this organization – Yad Avraham (“Hand of Abraham”) is that the Jewish people were able to defeat their enemies because they were engaged in ‘increased Torah study and prayer’. At some level, this is an accurate claim, although there are some holes to fill. True enough, one of the reasons the Jews did not fall prey to the ills of assimilation and loss of identity was their Torah study and prayer. By the common era (0 CE), the Jews had a codified collection of writings known as the Tanakh (an acronym for the three sections – Torah (Law), Nevi’im (Prophets) and Ketuvim (Writings)), also known as the Hebrew Bible or New Testament to Christians. By 500 CE, the Babylonian Talmud, the fundamental source of Jewish law, was completed. Jewish communities around the world also followed a similar liturgy in synagogue and in daily prayer. Thus Torah study of a standard codification of Jewish law, such as the Talmud, and prayer of a similar liturgy and content, served to united Jewish communities around the world, whether they lived in Lisbon, Bialystok, Cairo, or New York City. This unity allowed the Jewish people to ‘incapacitate and destroy’ the evils of assimilation and loss of identity, which, for the Jewish people, meant extermination. In this sense, Yad Avraham’s claim that Torah study and prayer were for the Jewish people what General Patton was for the US in WWII. The other side of this claim disturbs me as well. If the Jewish people are not engaged in ‘increased Torah study and prayer’, bad things will happen. In other words, if there are atrocities, if Jews are killed or seemingly unable to annihilate their enemies, they are being punished for not engaging in these activities – for not studying Torah. I accept that the study of Torah for its own sake has united the Jewish people, giving them strength and wisdom, but I reject the notion that lack of Torah study has brought the Katyushas or that, by studying Torah, I can stop them. Maybe I am too much of a skeptic.